Quarr Abbey on the Isle of Wight has been home to a community of Benedictine Monks since 1132. 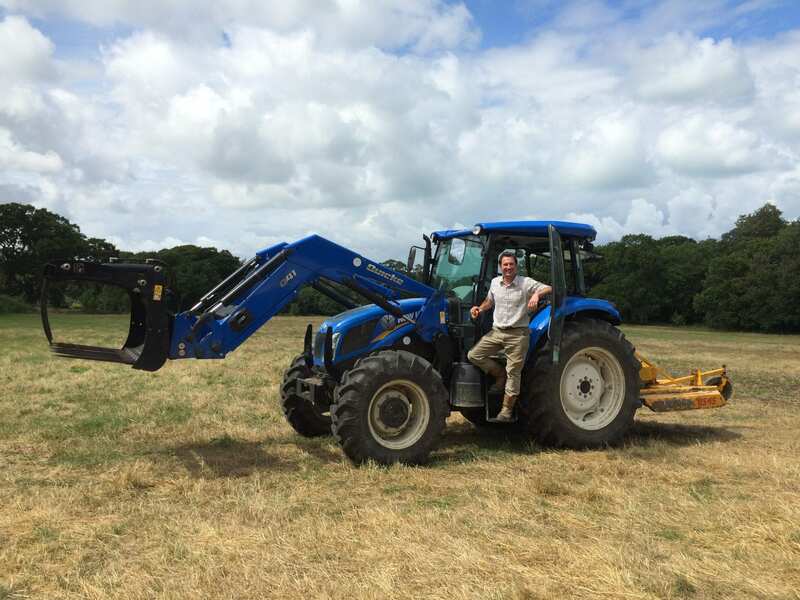 Earlier this year a New Holland TD5.95 from C&O Tractors joined the estate to help Head Gardener Matthew Noyce manage the 200 acre site, which comprises of ecologically diverse parkland, woodland, coastline, ornamental areas kitchen gardens and some livestock. The estate produces a wide variety of fruits and vegetables, many of which are heritage or heirloom varieties. The produce is divided up between the abbey kitchen, teashop kitchen and farmshop with surplus produce available for local hotels and restaurants to purchase. There is also a large orchard which produces cider and apple juice and the team have also recently created their own award-winning ‘Quarr Abbey Ale’. Whilst the Monks are involved in some of the gardening on the estate Matthew is the only one driving the tractor. He chose the TD5.95, supplied by C&O’s Newport depot on the Isle of Wight, based on the simplicity of the tractor and good reputation of the brand. “The TD5.95 lends itself perfectly to the estate tasks, whether it’s topping, load handling, towing, moving logs and woodchip or using the chipper on the PTO. There are plenty of applications to keep the new addition busy” said Matthew. As head of a small estate and gardening team, Matthew depends on the tractor to function on a daily basis. “I couldn’t imagine tackling the estate work without it now. The tractor has made our lives so much easier and the workplace more efficient. The Quicke loader and silograb are a great compliment to the tractor and a real asset. We went for a fairly low spec model due to budget constraints, but it still has all we need to get the job done” said Matthew. The monks lead a life of prayer and work and have lived in the present grade 1 listed abbey since it was built in 1912. Within the grounds there are ruins of a previous abbey built in 1132. Some monks work on the land and buildings whilst others are involved with internal affairs such as administration and the restoration and creation of books in the book bindery. The Abbey recently benefited from a Heritage Lottery Grant to make structural improvements to the buildings as well as improving the visitor experience by creating a Visitor Centre, a new monastery shop, meeting room, woodland walk, ruins repairs and excavation and various other community involvement projects. Matthew and the team have developed a ‘Land Use Project’ where local island community groups can use Quarr land to grow their own produce.